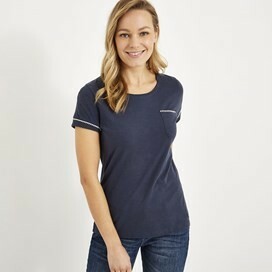 Our Tenby slub cotton t-shirt is the soft, comfortable and stylish choice that is sure to go with anything in your wardrobe. Made from 100% Cotton and with a small patch pocket on the left chest, we've also included contrasting colour stitching to give it a quirky edge. For a relaxed look and a cool, comfortable feel the Tenby t-shirt is the perfect choice. A year round staple, simply pair with your favourite skirt or shorts when the sun comes out, or layer underneath your favourite cardigan when the temperatures dip. Very good t-shirt - stunning turquoise/blue colour. Simple styling, good price. Very pleased. Nice fit will be great for summer! Nice enough, but far too generic.